The Type GXR Double-Roof Disk static mixer is an X-Grid crossing bar structure with an integral ring around the mixing element structure. It is used extensively for molten plastics injection molding and extrusion and for the processing of high viscosity polymers and resins. The entire mixing element structure with the surrounding ring is of monolithic cast construction (single molten metal pour) which makes the unit virtually indestructible. The GXR is considered a high performance design that homogenizes viscous materials in a short length (Licensee of Bayer AG). The Type GX static mixer is constructed of X-Grid crossing bars. It has been used successfully for over 35 years for the mixing and/or dispersion of viscous fluids. The GX static mixer is considered a high performance design that homogenizes viscous materials in a short length and is capable of mixing materials with equal or very large differences in viscosity and volumetric flow rates. 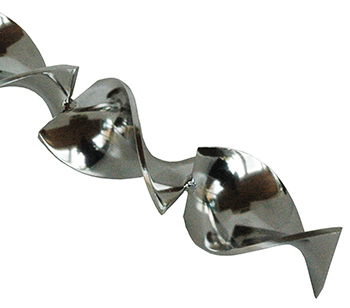 The Type HT Helical Twist static mixer is constructed of alternating-twist helical spirals. This bowtie inline mixer pioneered the motionless mixing industry over 45 years ago and is used for the mixing of liquids, gases and slurries. 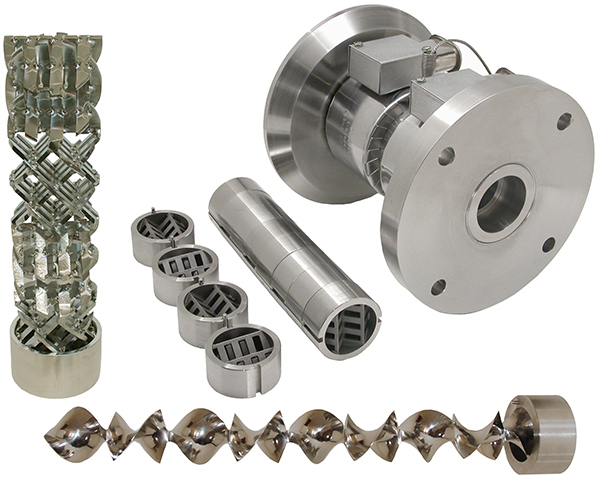 The HT Helical Twist static mixer is considered a medium performance design that is best suited for small diameter simple mixing and heat transfer applications. The Type GV static mixer is constructed of offset-stacked corrugated plates. It has been used successfully as an inline mixer for over 40 years for the mixing of low viscosity liquids, gases, immiscible liquid dispersion and gas-liquid dispersion and contacting. The GV static mixer is considered a high performance design that homogenizes materials in a short length. The Type LT static mixer is constructed of 3-tapered finger-like blades protruding from the inside pipe wall into the flowing fluid at a 45o lope in the direction of flow (as in a ski-jump). Because there are no pinch points or leading edges in the static mixer structure, the Type LT mixing elements eliminate all fears of plugging or fouling even when processing fluid streams that contain solids and fibrous material. If you can pump it, the LT static mixer can mix it without plugging. 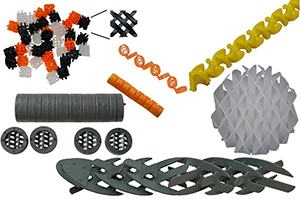 Plastic static mixing elements are available in all configurations, in sizes ranging from 1.7 mm (0.07”) to 24” diameter and in a variety of materials including Acetal, Polypropylene, PVC, Kynar and PTFE Teflon®. They are cost effective in many applications and are capable of handling the most severe acid environments. The SMB Extrusion Static Mixer Melt Blender creates high a very high degree of mixing of the polymer melt extrudate just in front of the die. Three types of commercially proven static mixer designs are available depending on process requirements. 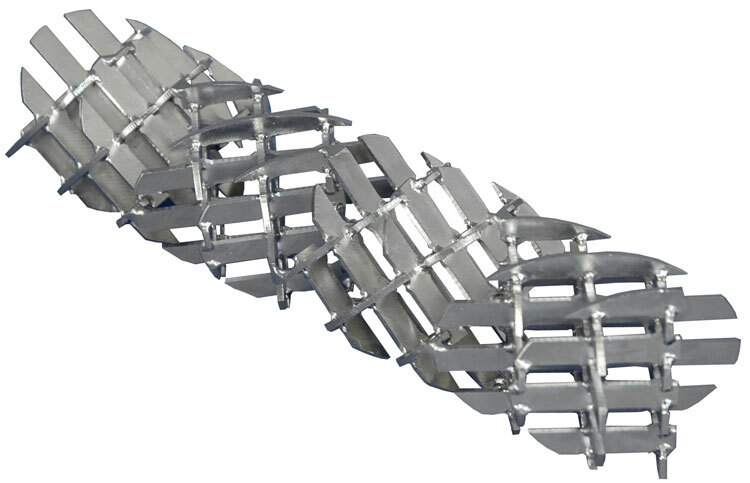 For high performance applications, the X-Grid crossing-bar Type GXR and GX static mixer designs create a very high degree of mixing in a short length. For medium performance applications, the helical static mixer design creates a modest degree of mixing at a low pressure drop. The SMN Injection Molding Static Mixing Nozzle homogenizes molten polymer during injection. 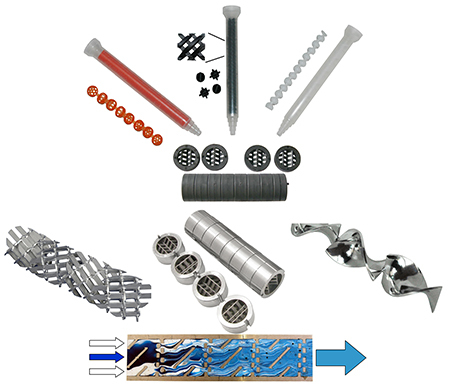 It creates a homogeneous polymer melt flow with regard to colorant, additives and temperature. This assures reduced spots, streaks and clouds of color; reduced colorant usage; and uniform parts as a result of mass and thermal homogenization. The optional SMF Filter is installed to protect the hot runner system and mold when processing regrind materials by avoiding clogging and/or damage with debris carried along with the feed pellets (e.g., staples, dirt, aluminum debris). Plastic disposable and metal static mixers are used extensively for 2-component (2K) resin systems. 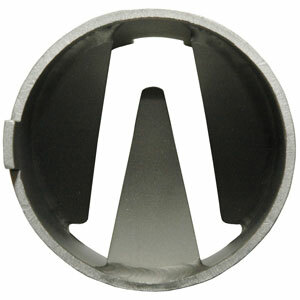 They are available in both high and medium performance designs. High performance designs are based on the X-Grid geometric structure where a high degree of mixing is achieved in a short length which is ideal for difficult applications. 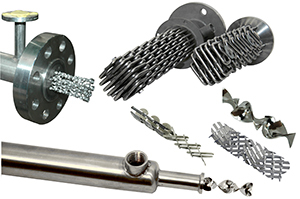 For simple applications, the cost effective industry standard helical twist design is best. Applications include the mixing of 2-component systems such as Epoxies, Urethanes, Liquid Silicone Rubber (LSR), Adhesives, Sealants, etc. Highly polished sanitary static mixing units are suitable for use in the food, pharmaceutical, cosmetic, beverage and other industries. When Clean-In-Place (CIP) operations are required, the Type HT Sanitary Helical static mixer is best due to its open structure. When Clean-Out-Of-Place operations are acceptable, the high performance Type GX polished mixing unit will create a very high degree of mixing in a short length. The heating and cooling of viscous materials in laminar flow is greatly enhanced by the use of static mixers. Motionless mixing inserts placed in an empty pipe decrease the boundary layer at the empty pipe wall and increase heat transfer by a factor of three to six. 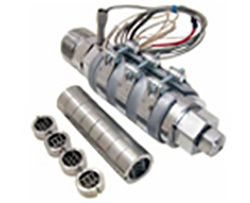 Depending on process requirements, the heat exchangers are available in monotube and multi-tube configurations and with removable or fixed static mixing element types GX, GXL or HT. Static Mixers create excellent radial mixing and plug flow conditions required to perform continuous chemical reactions with both low and high viscosity materials. Reaction technology improvements include the product of reaction having a very uniform history with regards to time, temperature, viscosity and molecular weight (narrow molecular weight distribution). Depending on process requirements, a typical small to medium size plug flow reactor is rack mounted and sometimes jacketed with removable static mixing elements type GX or GXL.